The pottery discussed in this article is principally from sites in the modern county of Devon but includes some material from the north-east coast of Cornwall, not least from Tintagel, which is relevant to the distribution of some of the pottery discussed below. 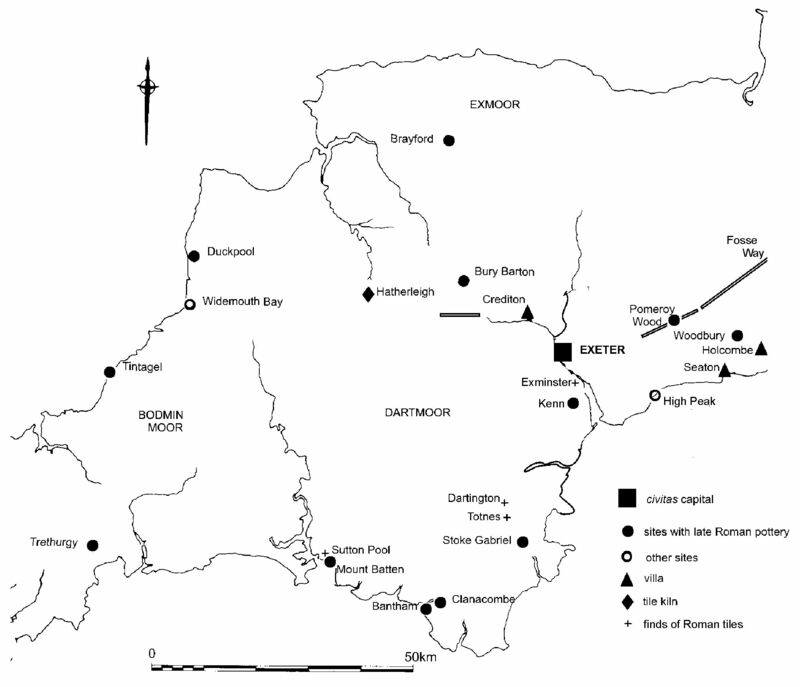 According to Haverfield (1924a, 214), Exeter (Isca Dumnoniorum), the civitas capital of the Dumnonii, was an 'outpost of Romanization in the far west', and the land beyond the River Exe 'presented none of the normal features of Romano-British life' (1924b, 2). A century after these observations were made (they were published posthumously), research on Roman Devon and Cornwall has altered parts of Haverfield's picture of the south-west. Cornwall is well covered in recent publications (for example, Nowakowski 2011); the last general account of Roman Devon was published more than 25 years ago (Todd 1987) and a brief summary of present knowledge is necessary. Rather than being an outpost of Romano-British culture, Exeter can be seen to sit in a sub-region that had several of the characteristics of urban and rural settlement in the remainder of southern Britain (Figure 1): a civitas capital with the thirteenth-largest walled area of all the towns in Britain, a road-system, road-side settlements of some sort, as at Pomeroy Wood (Fitzpatrick et al. 1999) and Woodbury near Axminster (Silvester and Bidwell 1984; Weddell et al. 1993), villas (though those west of Holcombe seem far from elaborate) and lower-status rural sites. The limits of this sub-region, as known from the distribution of certain or possible villa sites, lie well to the west and north of Exeter. Reused Roman tiles in the church at Exminster (Allan et al. 2008) and late Roman pottery at Kenn, including an unusually large amount of colour-coated ware (Bidwell and Croom 2000), suggest that there were villas on the west side of the Exe estuary; a villa is known near Crediton (Griffith 1988), 10km north-west of Exeter, and tiles, including a pila tile, are known from the Roman settlement at Bury Barton, a further 13km to the north-west (Todd 2002, 53-4). That there were also villas, or at least rectangular buildings with tiled roofs, even further to the west of Exeter has long been apparent from finds of Roman tiles from Dartington Hall, Totnes Castle and Sutton Pool at Plymouth (Bidwell 1980, 58, n.49), and a probable villa site has now been identified at Aller Cross, south of the Teign (see Postscript). Two recent discoveries add weight to these isolated finds. From Hatherleigh Moor, 37km west of Exeter, there are wasters from a tile-kiln (Wheeler and Laing-Trengrove 2006), and one of the fabrics (Fabric 3) of the tiles from Exminster church is in a slate-tempered fabric, which indicates that it was made in the South Hams or Ashburton-Totnes area (Allan et al. 2008, 123-4). Presumably, the main purpose of these kilns was to supply local building projects, with the surplus output of the South Devon kiln also being marketed further afield. Little is known about smaller rural settlements in the later Roman period, though some have been excavated in the Exe valley (Uglow 2000), at Pond Farm, Clyst Honiton, to the east of Exeter (Simpson et al. 1989), and in south Devon at Stoke Gabriel (Masson Phillips 1966) and Clanacombe (Greene and Greene 1970). Southern and central Devon certainly have some of Haverfield's 'normal features of Romano-British' life (1924b, 2), but it is unlikely that future research will reveal any dense distributions of villas, as in the area around Ilchester or in the Cotswolds. Rather, the picture that seems to be emerging is of a much diluted version of those villa-dominated landscapes to the east, a version that probably extended as far as the Tamar, with the villa at Magor Farm, Illogan, representing a far-distant outlier in west Cornwall (O'Neill 1934). 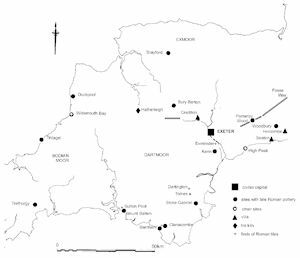 However, the starting point for what has been discovered about the area to the west of Exeter in the last two or three decades was almost a blank page, and future research might well alter the present picture fundamentally.